No doubt, the old tradition of producing objects by hands means handicraft is still well known in Baloch history. This tradition began centuries ago and is to date in progress. The handicrafts of Baloch are known all over the world due to their beauty of design, richness of colour and decent prices. Besides this, these handicrafts are exported to various foreign countries where they are warmly received especially by the people of west. This skill has been passed from one generation to the other. Along with this embroidery and needle work is very much renowned and attractive. This work is done by the women and girls who do not have to go out rather sit at their respective homes and do this activity in their spare time. They do earn some earnings by this since their handicrafts are sold. In fact, age is not a barrier against any handicraft, the Balochi embroidery is done in attractive colours and different designs. The women do a lot of fine embroidery, which is loved through the globe. The women, who do Balochi embroidery are called Doch-Ger. They work with keen interest and with confidence. Womenfolk hold competitions where women of all age take part in an activity called Rochocki. This is common all over Baloch region, truly speaking; needle work displays different designs and embroidery techniques which vary from place to place. Different areas of Baloch are known for their distinctive designs. In this regard, Dera Bugti is famous for Kowchik. Kowchik stitching has its own pattern which is embroidered on shawls and shirts for the women. While in Kalat and Khuzdar Moshamamka is famous and its stitching has different colours, usually red, green and grey on white or yellow garments. It’s embroidered on shawls, cushions, and tablecloth and bed sheets. 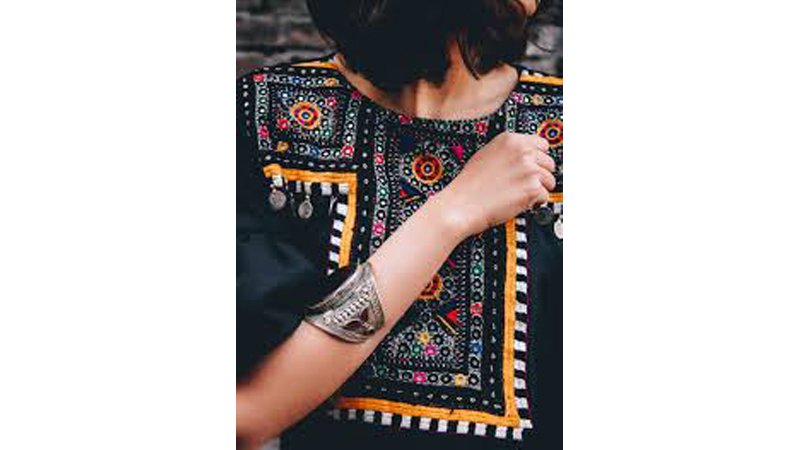 In addition, it also includes the use of tiny mirror work and in Sibi areas Jok is famous which is embroidered by fine thread of various colours and shades are used. It is very much renowned for the delicacy of its design. There stands huge difference in the embroidery worn by the old women, and the embroidery worn by the young girls. The old women wear dresses of dark colours and with sober embroidery, while the young girls wear dresses of bright colours with rich embroidery. Embroidery is done on all parts of the shirts like sleeves and the front etc. There are many kinds of embroidery across Balochistan; some of the names are known as Murg-e-Paanch, Kantuk-e-Naal, Chamkali, Turbat-e-banoor, Kumb o glass, Garkital, Kalatuk a jin, Arif-e-chader and many more. Certainly, the needle work of Baloch culture has its majestic recognition. Furthermore, carpets and wall hangings of Baloch are another source of attraction for the customers. Carpets are not only a special part of the setting in tribal households but the tradition has also won a place of popularity in the urban. The pottery and ornaments have always been the symbols of the development of civilisation. Ornaments have always been the items of special interest and attraction for the women. The Balochi ornaments, specially, the silver ornaments show the skill and artistry of the craftsmen. The whole process of ornament production from the point of melting the metal to the finished product is accomplished without using any machine. Thus, they are in great demand at the national and international jewellery market, the handicrafts industry of Balochistan is encouraged and foreigners are very much impressed. The handicrafts also boost up the image of Baloch in international circles as they reflect the artistic temperament of a nation and it’s yet going on in Baloch history.